You know those signs that have an outline of a deer or here in the White Mountains an Elk? Or the sign says “Watch for Animals,” “Deer Crossing,” or “Watch for Elk?” We’ve probably driven past those signs hundreds of times and never see hide nor hair of any wild life. Except this time. I don’t think that big horn sheep are very common in AZ. However, on Highway 270 there is a sign that has the silhouette of a big horn sheep and the phrase Next Mile. Didn’t think anything of it. Until a herd of big horn sheep ran across the road. Yep a herd of about 20 females, juveniles and babies. The females do have horns but only about 20 percent of the size of the males. We didn’t see any adult males but I have the feeling they only come around during rutting season. Those, sheep whether male or female, can really move. By the time Brian got the camera up to the car window they were gone. They can jump too even the little ones. From standing to over a four foot fence. No problem. But that’s not all there is to our animal adventure. 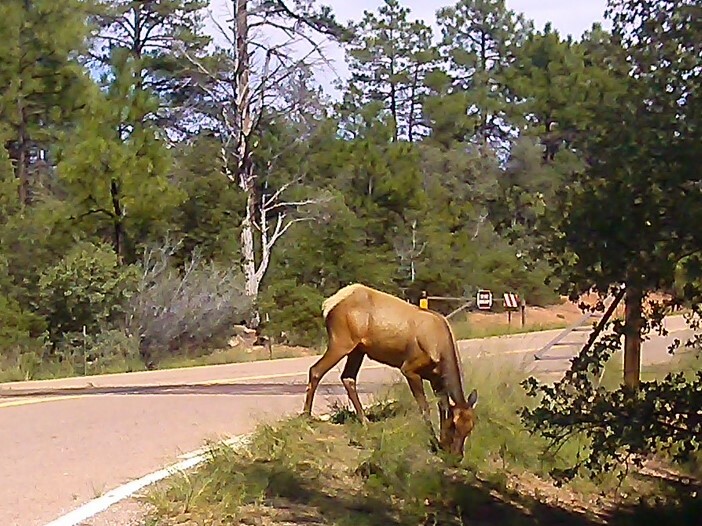 Driving from Greer back toward Payson we saw a herd of Elk crossing the road. Traffic came to a standstill. Which was fine except we had just crested a hill so the cars behind us had no idea traffic was stopped. Nearly got rear- ended. Note to Self: Always have the camera ready on the phone.